The Damned Things project was born in early 2008, though didn't rear its ugly head on the live stage until mid-2010. Their debut album Ironiclast was met with positive reviews for it's fresh take on hard rock, fusing the stylings of classic rock and heavy metal. The Fall Out Boy members brought the punk and pop, the Every Time I Die Members brought the modern metal, and the Anthrax guys brought the classic thrash. On top of that, Caggiano's Volbeat influence brought a more bluesy groove that melted with Buckley's crooning Southern-esque vocals. The result is a a hard rock sound that doesn't feel rehashed. You won't find any Three Days Grace in the ten tracks of their debut, but more Zeppelin and Black Sabbath. It's not a brand new concept, but it's an effective and memorable one. If you're looking to get into The Damned Things for the first time, you're in luck. The band has a total of 11 songs between one album and an unreleased track available on the Batman: Arkham Origins Soundtrack. Dipping your ears into the cool riffs on "Handbook for the Recently Deceased" and "Friday Night (Going Down In Flames)" is a good starting point. The ripping guitars blaze alongside Buckley's straight clean vocals, a nice change up from his gruff approach on Every Time I Die tunes. Or, if you prefer the harder sound, "Ironiclast" is all but a more streamlined Every Time I Die song. "Graverobber" is another that focuses more on the chugs and bass pedals but where ever you choose to start off, you can't go wrong. 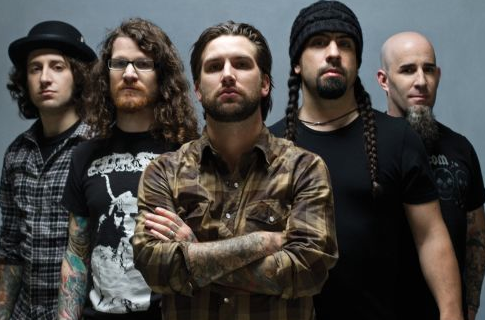 The Damned Things are on a hiatus as each member is back with their bigger bands, and it's even possible the band may never return. That shouldn't hinder your enjoyment of the blues metal that The Damned Things churn out so sit back, grab a beer and click play because it's going to be one hell of a ride.